The Law of Attraction is a powerful tool for transforming your life. It’s only natural that you want to share the Law of Attraction with everyone you know. Some people will be receptive to what you tell them about the Law of Attraction. But with other people, it might backfire. Perhaps you’ll be scoffed at, ridiculed, or made to feel like you have to sacrifice a part of yourself. It’s not fun at all! Remember, there is nothing more powerful in the Law of Attraction than feeling good – about yourself, the things you do, and life in general. That’s why the right time to tell someone about the Law of Attraction has nothing to do with what you have created in your life. 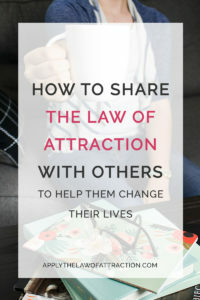 How do you know when you should share the Law of Attraction with others? My simple tip is to look at why you want to tell another person about the Law of Attraction. Are you trying to help, or are you trying to rescue? When you are helping, you are not accepting responsibility for what others are creating in their lives. You are coming from a place of love and respect. While you might help them manifest their dreams, you are not doing the work for them. Rescuing is different. It comes from a belief that you think they need your help because they cannot help themselves. It doesn’t respect the other person’s knowledge (deep down inside them) that they can change their life when they want to change it. If you find that you are rescuing, the rescuing is coming from a fear in you. It could be a fear that they are unable to change their lives, or a fear that you have to tell them about the Law of Attraction to be a good person. It could even be that you are afraid they don’t love you enough and you can increase their love for you by sharing the Law of Attraction with them. As hard as it may be to watch someone in a less than ideal situation, it might be the learning experience that person needs to create a radical shift in their lives. If you’re ever uncertain if you’re helping or rescuing, hold back and let them come to you. Change how you see others. See them as having a magnificent life that keeps getting better and better. Know that they truly are unlimited in their ability to achieve greatness. Focusing on how their life is improving will help you to feel better. Don’t think about the problems in their life or how their life could be better if they did “X” instead. See them as happy. Imagine having a conversation with them where they tell you about how amazing their life is. Be grateful that they have found their way in life. Helping people is important. Everyone needs help to be successful. We are born into this world needing help from others just to survive. But we also have to look at why we are helping. You have to make sure that helping respects your healthy boundaries, and respects other people’s ability to create their own life. The right time to tell someone about the Law of Attraction will blossom on its own.